An unknown production by the Cromer Players. The Cromer Players were newly formed after the Second World, with the intention to produce several plays in Cromer each year. 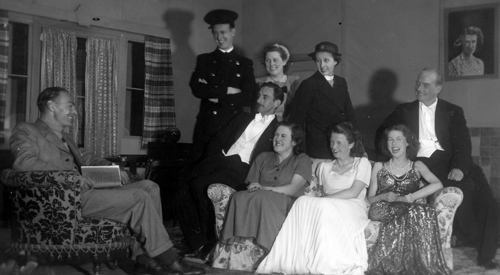 The first production is believed to have been 'A Soldier for Christmas', Reginald Beckwith's comedy in three acts. At the time of writing , several of those who took part in the productions of the Cromer Players may be able to help us with some more details. Please make use of the 'Feedback' page for this if you can. Is it correct that there were productions in both the Town Hall and the Parish Hall? Is there a complete list of productions? In particular, can anyone assist with identifying the productions for which we have pictures and also give us the names of those where the cast member is not recorded?